gain the upper hand. Missing in the chaos is businessman Charles Avery. Hired to find him is Vietnamese Australian ex-cop Max Quinlan. 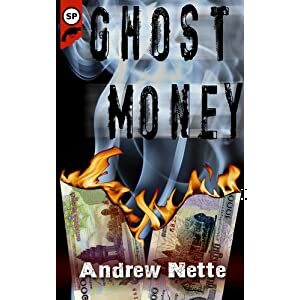 Ghost Money is a crime novel, but it’s also about Cambodia in the mid-nineties, a broken country, and what happens to people who are trapped in the cracks between two periods of history, locals and foreigners, the choices they make, what they do to survive. The thing that struck me most about GHOST MONEY was the feeling of authenticity and detail about a period in Cambodian/Vietnamese history that I have lived through but am sadly ignorant about, despite Australia’s involvement in the so-called Vietnam War. Andrew Nette uses his principal characters and those whom they meet, to deliver a series of mini-history lessons, starting with Australian/Vietnamese Max Quinlan’s own background. In a strange way, Quinlan and Cambodia had history. Memories of his father shouting at their black and white television, on the screen, Asian soldiers, terrified faces under steel helmets too large for their heads, running from an invisible enemy, the sky behind them full of fire and smoke. It was 1975; Max was nine years old. Phnom Penh was about to fall to the Khmer Rouge. His father Lester Quinlan was stationed in neighbouring Vietnam as an Australian army advisor in the mid-sixties and images of the war had been commonplace in the lounge room of their house in North Melbourne. The images fascinated Quinlan as a child, only becoming menacing with his father’s growing agitation over the course of the conflict. When Saigon had fallen a month earlier, Lester Quinlan had yelled at the newsreader like an irate football fan castigating an umpire for a bad decision. Maxwell Quinlan had been born in the port town of Vung Tau in 1965. Three months later his Vietnamese mother was killed when a bomb exploded in the local market where she was shopping. Lester brought the boy home – his last act of bravery before drink and bitterness consumed him. Quinlan’s search for missing businessman Charles Avery takes him, and the reader of course, from Thailand to Phnom Penh. Despite the slabs of historical detail, or maybe because of the vividness of it, we remain engaged in the realism of the search for Avery and an understanding of what he is up to. An impressive debut novel, hardly surprising given Nette’s own journalistic experience, and interest in pulp fiction. and a number of non-government organisations. Australian crime fiction, released in 2012. Max Quinlan is an Australian ex-cop who has somewhat haphazardly fallen into the work of of locating missing persons. To that end he arrives in Phnom Penh on the trail of businessman Charles Avery whose sister has hired Max to find her brother. With Avery proving elusive Max teams up with an Australian journalist and his Cambodian translator to track Avery through the underbelly of the city and beyond. As you might expect of good noir fiction Max is a troubled soul, having had a somewhat desultory upbringing after being orphaned as a young boy. He doesn’t quite belong anywhere given he looks Asian but has only ever lived in Australia and has now lost the only job he ever wanted. But he is not, thankfully, a walking stereotype of the genre (there is no alcoholism or long-suffering ex wife in sight) and as this book progresses he starts to learn some things about himself as he searches for a redemption of sorts. He contrasts nicely with the Heng Sarin, the translator working for the journalist Max teams up with. Sarin is a survivor – of the Killing Fields, refugee camps and life in general but he is pragmatic and surprisingly free of the bitterness a person in his circumstances would be entitled to feel. Nette also uses Sarin and other key characters in the book to, through their personal histories, show us the history of the country in an engaging way. Writers who are not native inhabitants of the setting they depict can have a tough time delivering an authentic atmosphere but that has not been a problem for Nette who has created a truly enveloping sense of time and place. Partly this is because he lived and worked as a journalist in South East Asia, including Cambodia, for a good portion of the 90’s and partly because he has chosen to tell the kind of story that suits an ex pat’s observations. It is the story of an outsider – an Australian man with Vietnamese heritage – who lands in a small, crowded country bordered by Thailand, Laos and Vietnam which seems to have acted as the spoils of war for half the world’s major powers over the years and was, in the 1990’s, only just beginning to recover from one of the deadliest periods of civil war and occupation in global history. Nette has captured this richness in vivid detail, showing the myriad kinds of survivor such a history produces, the multiple forms of foreigners either trying to make a buck or provide well-meaning, if occasionally misguided or even patronising, assistance such a place attracts and displaying the complex social and physical environment that must inevitably result from successive reigns of occupation and brutality. In Nette’s Cambodia there is beauty and ugliness, the corrupt and their victims and you never know which will be waiting for you on the next page. I’m never sure that I really like, or entirely understand, noir fiction because endless darkness does not, in itself, appeal. But when I am carried along by a story made unpredictable because in it there is some remote hope that happiness, or at least an absence of perpetual despair, might be around the corner at least for some minor character or other, I wonder if I might not be a fan after all. Because when the grimness, the violence, the hopelessness and despair that are the hallmarks of the genre serve a genuine storytelling purpose, as they do here, I become totally absorbed in a way that rarely happens when reading other books. 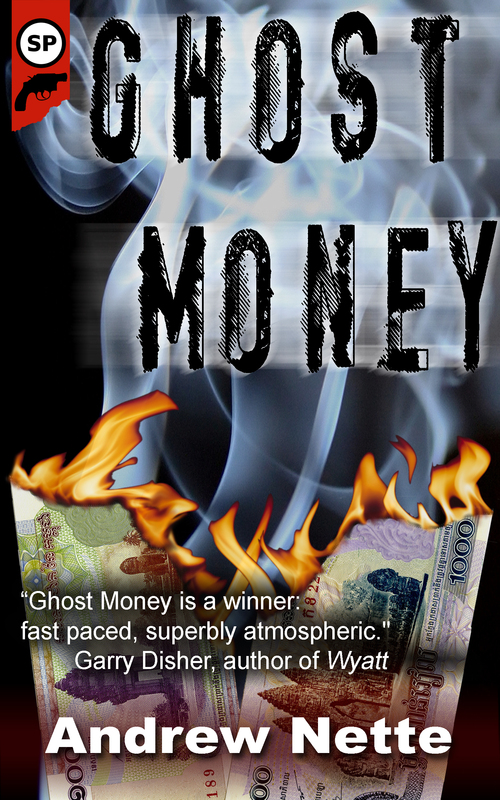 GHOST MONEY is not for those wary of violence but there is no element of gratuitousness here: the violence is as much a part of life as breathing in this environment and, unsettlingly, it doesn’t feel like fiction. GHOST MONEY packs a lot of action into its admirably compact package. It really doesn’t let up from the moment Max discovers the body of his assignment’s business partner on the first page. He and his newly made Cambodian colleague encounter mercenaries, a deluded saviour, official and unofficial spies and a myriad of former and current soldiers as they follow Avery’s trail across the country. At times you forget it’s a crime novel, but only because it’s also a fascinating tale of a time of chaos and the people who survive it. Andrew Nette is a writer based in Melbourne, Australia, with a fascination for crime fiction and film, obscure pulp novels and all things Asian. He lived in Southeast Asia for six years in the nineties, based in Laos, Vietnam, Cambodia and Thailand. During that time he worked as a journalist, and as a communications consultant for the United Nations and a number of non-government organisations. He has since travelled frequently in Asia and lived in Phnom Penh with his family for a year in 2008, where he wrote for the international news wire, Inter Press Service, and worked on a European television documentary on the international tribunal into the crimes committed by the Khmer Rouge. Andrew is also one of the founders of Crime Factory Publications, a Melbourne-based small press specialising in crime fiction, and helps edit Crime Factory, its on-line magazine, which appears four times a year. He is also one of the editors of Crime Factory Publication’s second book, Crime Factory: Hard Labour, an anthology of short Australian crime fiction, due for release later in 2012.